Wolverine #2 Open Thread: Meeting the Devil? On sale October 6, 2010. 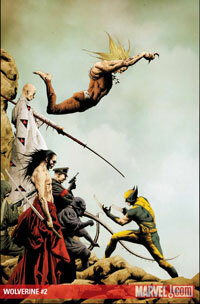 8 Comments on "Wolverine #2 Open Thread: Meeting the Devil?" i was surprised to see mariko in hell, that was baaad for wolverine. i hope they deal with wolverine’s thoughts on it once he gets out of hell. the second issue really picked things up. Was alot better than last ish…still waiting for something that just piques my interest…I’m tired of Wolverine being controlled stories. The Mariko shocker was all types of F’d up though. yukio isn’t dead, she was able to escape the demon wolverine together with amiko.i just checked wolverine 2 again and you’re right, cyber is there. i always thought that he survived since he was just left for dead..
OK? Ummm, why would Mariko be in Hell? yeah, that’s a pretty good point about Cyber. if he’s down there, i’d imagine the soul of the host body would still be the slow big kid, not to mention not having the adamantium skin and suit. I suppose Mariko could be explained away for Clan Yashida in general. Cyber as he is makes no sense at all. Any guesses on who that guy with Puck is at the end? I’m going to guess it’s Thomas Logan, his biological father.